Growing up in Fremont in the 60’s, I visited here several times since we studied the missions in elementary school. There were “shadows” in the old cemetery on more than one occasion. My dad, and ex-policeman, dismissed this until he saw padre and Indian he couldn’t explain. I was here with my family yesterday. We enjoyed learning about the mission and looking at the exhibit. As soon as we entered the Church my 4 year old started shivering and saying it was scary. As we were walking around she started saying “those eyes are looking at me” there was no one else there and where she was pointing there were no statues or pictures. We then went out to the cemetery she immediately started asking to go home. When we walked through the church again to leave she begged not to go in and said that “Jesus looking guys was following her”. We have had experiences before where she seems to pick up on Spirits of those who have past. It always suprises me, but I thought I should look up the history and try to “see” what she was seeing. 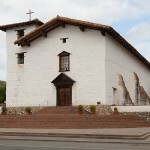 When I was a teenager I visited the mission frequently when I would visit my grandmother up the street. One time however was different. My little brother and I were existing the chapel into the cemetery and as soon as we went to open the door, we heard a man yelling from the bell tower and my brother took off running to grandmas in fear. When we told Grandma about it she said the place was haunted and there are many stories! I’ll never forget that day!